 Arachnophobia – The spider as a symbol of fear: Biological, cultural or neither? As tarantula hobbyists, we are confronted all too often with ‘arachnophobia’. Moreover, I’ve found myself to have been personally insulted just because of the fact that I keep and breed arachnids. Showing a picture on a social network is enough for countless reactions along the lines of “Gross, how can you be in the same house as that?” and “That’s repulsive! I’m blocking your pictures!”. I’ve always wondered: if people would react the same on pictures of dogs and cats (for example), would those reactions be justified? No, a reaction like that would get you crucified, because you have to respect the animals of your friends and acquaintances. So why isn’t this valid for arachnids? What is it that demonizes arachnids in today’s world? Has it always been like this or is it just a contemporary thing? Is there an evolutionary reason or are we just making it all up? I’ll try to answer these questions in this article. Oh, just to make sure that I won’t be crucified myself after this paragraph: I have a dog myself too, which I love, and I like cats as well! First of all, let us tackle the actual term ‘arachnophobia’. The Oxford English Dictionary defines the word as an “extreme or irrational fear of spiders”. Merriam-Webster tells us that it is a “pathological fear or loathing of spiders”. It’s striking that the latter uses the word ‘pathological’, which leaves no doubt about the character of the problem: it’s a medically ascertainable illness or mental problem. It seems, therefore, that we use the term ‘arachnophobia’ a bit too often. An ‘everyday’ fear of spiders is not something we should call ‘arachnophobia’. We can only use the term when it gets worse than that: people who get uneasy, or even start getting panic attacks, when they are in any area they believe could harbor spiders or that has visible signs of their presence, such as webs. They will show physical symptoms, such as – as mentioned before – panic attacks, screaming/crying, troubled breathing, excessive sweating or even heart problems. In some extreme cases, even a picture or a drawing of a spider can trigger this kind of fear. 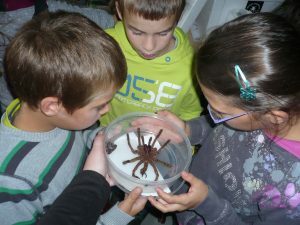 According to a German study (Schmitt, 2009), between 3.5 and 6.1% of the world population is affected by arachnophobia. With over 7 billion people in the world, this means there are literally hundreds of millions of people who suffer from it. This number is astonishing. I did a simple test myself. I googled for ‘most common phobias’. On the first result page alone, all of the hits I got – yes, ALL of them – were lists of phobias that had arachnophobia in the top ten, and in most of them, it was at number one. And even if some of the websites had no scientific basis for composing the list whatsoever, it tells us a lot about people’s perceptions of these particular fears and phobias and especially, of course, arachnophobia. It seems that there are few animals that engender in humans the degree of disgust and irrational fear that spiders do. It seems absurd that neither the size, nor the danger of the animal – apart from some exceptions – justify the degree of anxiety and panic that this little animal can cause. An old medical term ‘hysteria’ is appropriate for this state, and seeing the number of people affected by it, maybe even ‘mass hysteria’. This reaction suggests that it is exactly the spider’s psychological significance that is the real danger. According to ‘Bitten in the Soul’ (Magialavori, 2005), man has always had the fantasy of being a victim to the spider which, in itself, is an absurd distortion of the biological reality. These fantasies include the perception of being threatened and an insidious and ambush-like feeling; being caught in the web of the spider. He also names the importance of the female gender in the spider world as a fundamental point of extraordinary importance. He refers to Freud and psychoanalyst Karl Abraham, interpreting the spider’s infantile existence in man’s subconscious as the wicked mother of whom the child is afraid. The biological fact that the male spider is significantly smaller in size than the female means that copulation is a risk to his life. So maybe these fantasies were an early expression of (conscious or subconscious) fear of women in a male dominated world? Furthermore there is the powerful symbol of captivity, an animal that has the power to ensnare its victim, and restrict the autonomy of the individual before taking its life. So we know that arachnophobia is not just a contemporary notion, as it’s been described in the 18th and 19th centuries already. But can we trace it back even earlier than that? Let’s take a look at some cultural depictions of spiders, and what their role was. When gathering information, it quickly becomes apparent that spiders have had many cultural depictions from early on, representing various things. Yes, various things. This means: not only fear. The spider, along with its web, can be found in mythological fables, spiritual and occult depictions, cosmology, ancient oral traditions, etc. • In Ancient Egypt, the spider was associated with the goddess Neith, a symbol for the ‘weaver of destiny’. This link continues later on through Ishtar (Babylonia), Athena (Greece) and later equated to Minerva (Rome). Arachne, cursed by Athena to ‘hang’ forever as a spider from a thread. • In Greek-Roman mythology, Arachne was a skilled human weaver who bragged that she was a better weaver than Minerva. Minerva (as Athena) was the goddess of weaving (amongst others). Arachne refused to acknowledge that her skill came from Minerva. 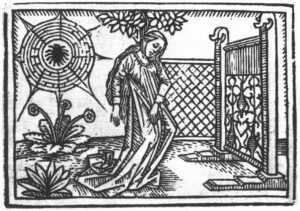 According to Ovid, the goddess was so envious of the magnificent woman-made tapestry, that she destroyed the tapestry and loom, slashed Arachne’s face and turned Arachne into a spider. This the origin of the name ‘Arachnida’ in biology and taxonomy. • In African mythology, the spider can be found both as a creation deity and as a ‘trickster’, resulting in allegorical stories that teach a moral lesson. • Native American cultures also include a trickster-spider, known by several names, and a creating deity called ‘Spider Grandmother’, who created all things through the shimmering threads of her body. Another legend tells about the constellation Ursa Major being born as seven men transformed into stars, and climbing to paradise by unrolling a spider’s web. 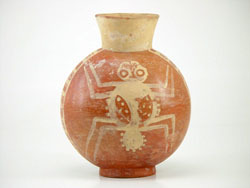 Ancient Peruvian art depicting a spider (300 CE). • In Ancient Peru, the Moche people included artwork of spiders in their worship of nature. • In native Australian art, spiders symbolize something sacred. There is a Lord Spider called ‘Nareau’, who created the universe. • In Japan, the ‘Tsuchigumo’ (translated: Earth spiders) were a mythological ethnic group said to have lived in caverns, as well as a mythical supernatural creature in the form of a boy as well as a giant spider. Also in Japan, there is a depiction of a ‘whore spider’, able to transform into a seductive woman to seduce samurai. She is called ‘Jorōgumo’, referring to the golden orb-spider Nephila clavata, commonly called ‘Jorō-gumo’, or ‘Jorō spider’. • In Islamic tradition, the spider is a holy, to-be-respected animal. In a story where the prophet Muhammed and his companion Abu Bakr were being pursued by soldiers, it was the spider (commanded by Allah) that weaved a web across the opening of the cave where they were hiding. The soldiers passed the cave, figuring Muhammed and his companion could not have entered without breaking the web. • A 10th century Saint called Conrad of Constance is represented as a bishop holding a chalice with a spider in or over it. According to legend, a spider fell into his chalice while he was celebrating mass. Even though spiders were believed to be deadly poisonous (yes, poisonous, not only venomous! ), Conrad drank the wine anyway, with the spider still in it, as a token of faith. • In a (possibly apocryphal) legend about King Robert the Bruce of Scotland (14th century), the spider symbolizes hope and perseverance, after the king saw the spider failing to climb its own silken thread. He noticed, though, that the spider persevered and eventually succeeded. This realization made him come out of hiding, eventually winning Scotland’s independence. So, it is evident: spiders have been a symbol for a wide array of things for thousands of years. Though clearly not only symbolizing fear, it seems that spiders have always provoked a somewhat mystical feeling. Their appearance as well as their behaviour have inspired numerous legends, stories and sagas alike. So where did the fear start? Studies indicate several options, and I’ll gladly go over some of them for you. It is clear that an evolutionary reason for phobias such as arachnophobia remains unsolved. Though all of the theories have their merit, there is no clear answer to the question: ‘Why are people afraid of spiders?’ And with this, I’d like to share a personal experience. In my daily life, I teach in primary school, mostly 8-9 year olds. Every year, when autumn arrives, you see ‘creepy crawlies’ showing up everywhere. 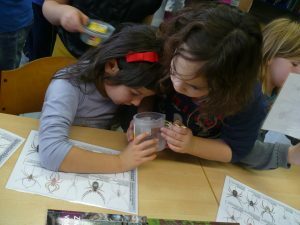 One of the kids usually starts with bringing a small plastic container to the classroom containing a spider, some caterpillars, worms, centipedes, millipedes or some kind of invertebrate they have found. Soon after that, half the kids in school are trying to find animals all over the playground and have their satchels stuffed ready with empty plastic containers. At first, some kids will be reluctant to help catching the animals, preferring to observe their friends rather than partaking. It’s at this point that I usually bring some of my own animals to school. With my personal tarantula collection, I feel it’s a fantastic way to show these kids what other arachnids can be seen in the outside world. This particular lesson (I’ve given it several times) always has the same result. At first there will be some kids who are hesitant and some that even admit they are scared and don’t want to come near me when any of my arachnids are close, even with all terrariums safely closed. Yet slowly, very slowly, the fear starts to subside. Soon, they’ll be touching and observing moults, looking at the spiders from every possible corner and asking me to hold them. To which I say, “No.” I explain to them why it would be very stressful for the animals to hold them and that I never do it myself unless it is unavoidable. They quickly understand that spiders are animals to be respected rather than to be feared. In the weeks after this class all of them will be collecting spiders from the playground and their gardens, explaining to their parents how you can recognize a male or a female spider, etc. In the parent-teacher evenings we usually have late October, the parents tell me – joking – that their kids are now like me, loving spiders and wanting to keep them, but that they (the parents!) are still afraid of them! Well, do I need to say more to conclude this article? If you ask me, yes, it’s an acquired fear, not one we are born with. I would like to thank Steven Lenaerts for proofreading this article and for helping me with the finishing touches, as well as Peter Kirk for his helpful tips. Last but not least I’d like to thank the children who were my ‘subjects’ for the last part of this article, and their parents for allowing me to use their pictures. • Schmitt, W.J. (2009): Neurobiologie der Spinnenphobie. Schweizer Archiv für Neurologie 160 (8): 325-355. • Magialavori, M. (2005): Bitten in the Soul. Matrix. Chapter: ‘The Myth’. • ‘Arachnophobia’ Wikipedia: The Free Encyclopedia. Wikimedia Foundation, Inc. 22 July 2004. Web. July 2014. • ‘Cultural depictions of spiders’ Wikipedia: The Free Encyclopedia. Wikimedia Foundation, Inc. 22 July 2004. Web. July 2014. • Davey, G.C.L. (1994). The “Disgusting” Spider: The Role of Disease and Illness in the Perpetuation of Fear of Spiders. Society and Animals 2 (1): 17–25. • Cohen, T. (2012, June 13). The shape of fear… Why spiders scare us so much: Humans are hardwired to fear their angular legs and unpredictability. The Daily Mail. • Association for Psychological Science. (2011, January 25). People Aren’t Born Afraid of Spiders and Snakes: Fear Is Quickly Learned During Infancy. Special thanks goes out to Hans Cools for giving us the opportunity to share this beautiful article on our website. This article has been published in The Journal Of The British Tarantula Society, October 2014, 29 (3), page 120-125. However many strategies to overcome arachnophobia can be found on the internet, we leave the approach to the professionals. C(ognitive) B(ehavioral) T(herapy) has proven its effectiveness throughout the years. V(irtual) R(eality) Therapy might be an option as well. Best of luck in your courageous attempt to overcome your fears. Read more about anxiety disorders or fear. Talk about the possibilities with a psychotherapist. More questions? Contact a psychotherapist. Or look for psychotherapists in Antwerp, Ghent, Leuven, Mechelen, Bruges, Aalst, Brussels, Kortrijk.